bait pool in my truck for anyone that might want live bait. Well... I'll be bringin' a cast net but you can earmark a dozen spot for me. Let me know how much you want & I'll settle up with you with a check or at the tournament - your choice. Thanks, again, for steppin' up!! else has on theirs. I can't wait! It's always a blast being with everyone! species could win this for you! **NOTE** We do not have Sandworms this far south. You'll nee to grab them from your area prior to coming south!!! I've actually had two people email me the same question regarding spot. 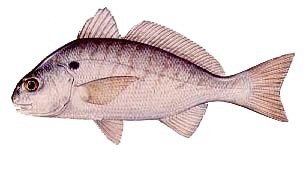 For the northern folk (LOL) Spot are different than Bunker (menhaden, pogie, etc) They are in the grouper/drum family and are a really hardy bait. They are in the surf thick right now and are in the 6 inch size range which is perfect! Locals call them Striper Candy! When the Cape May Rips get red hot, bait shops will charge up to 4.50 each for them. How many fillets in a package??? Looked like 8 to 10 fillets. Might be a weight thing. The sizes varied.